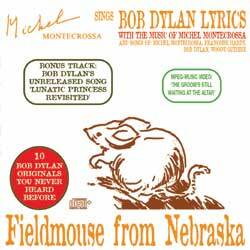 ‘Michel Montecrossa sings Bob Dylan’ site added – lots of CDs & info!! The next High-Drive Michel Montecrossa Concert, namely the ‘Laughing Cyberrock & Climate Change Concert’ will be staged on 7.02.2009 at the Omnidiet Resort and Business Hotel situated in the green hills above the North Italian Lake Maggiore. The concert will be accompanied by an exhibition of Michel Montecrossa’s masterful paintings, drawings and Cyberart. “Do you hear it laughing in the political kindergarten? Do you hear it laughing in the war of words? What I really want is love till the end. Laughing is what I understand. Konzert-Vorschau für Februar!!! Michel Montecrossa’s ‘Courage & Love Climate Change Concert Tour’ geht am 7.02.2009 in der norditalienischen Künstler-Oase ‘Omnidiet Hotel’ mit dem ‘Laughing’ Cyberrock & Climate Change Concert weiter, das von einer Ausstellung von Michel Montecrossa’s visionären Gemälden, Zeichnungen und Cyberart begleitet werden wird. Saturday, the 23rd 2009: Michel Montecrossa and his band The Chosen Few present great Michel Montecrossa and Bob Dylan songs at the ‘Sunglight Dance’ Concert, Omnidiet Music Hall from 10 p.m. – 1 a.m.
‘Saving Message’ Concert Video is online!!! Yeahhh!! Here it is!! 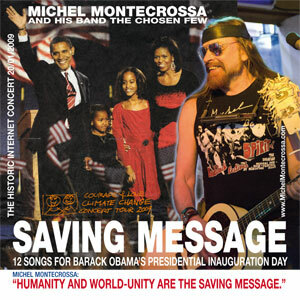 The Video of Michel Montecrossa’s ‘Saving Message’ Internet concert dedicated to President Obama’s Inauguration on 20/01/2009!!! Yeahhh!!! Hier ist es!! Das Video von Michel Montecrossa’s ‘Saving Message’ Internet-Konzert zur Amtseinweihung von Präsident Obama ist jetzt auf dem Newsletter .. und natürlich auch hier .. !! Cyberrock 4 ever!!!!!!!!! 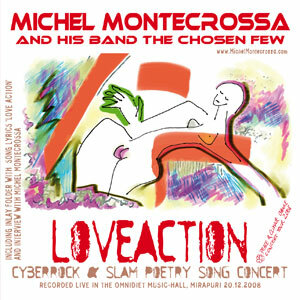 Video for Michel Montecrossa’s ‘Courage & Love Climate Change Concert Tour 2009’ is online!! 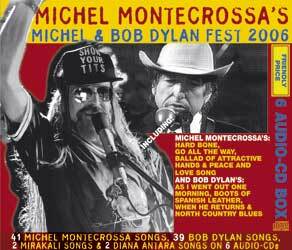 Video zu Michel Montecrossa’s ‘Courage & Love Climate Change Concert Tour 2009’ ist online!! Saving Message – Michel Montecrossa gibt Internet Konzert zur Amtseinweihung von Präsident Barack Obama und den ersten 100 Tagen seiner Präsidentschaft. Ich werde diese tolle Meldung vom Michel Montecrossa Newsletter hier weiterfeiern und gebe hier nochmals den Hinweis: Man kann sich jetz schon die Audiofiles dieses genialen Konzertes anhören – Gleich hier!!! Saving Message of the wisdom. Saving Message of courage strong. Saving Message of love always young. Saving Message of freedom born. Saving Message for the great morn’. Saving Message when all is a-turnin’ ’round. Saving Message for all time to come. Saving Message like your beauty song. Saving Message leads us through the open door. More news for this topic: Michel Montecrossa’s ‘Saving Message’ Internet Concert is dedicated to Barack Obama’s Presidential Inauguration on 20/01/2009 and the first 100 days of his presidency. See here above already the song lyrics for ‘Saving Message, the title song of this Internet Concert by Michel Montecrossa as well as the links for the complete Audiofiles of the ‘Saving Message’ Concert!! Das ‘Saving Message’ Internet Concert wird von Michel Montecrossa anlässlich der Amtseinweihung von Präsident Barack Obama sowie den ersten 100 Tagen seiner Präsidentschaft gegeben und stellt gleichzeitig das Eröffnungs-Konzert seiner diesjährigen ‘Courage & Love Climate Change Concert Tour 2009’ dar. Das 12 Titel umfassende Konzert wird auf dem Michel Montecrossa Newsletter vom 20.01.2009 – 30.04.2009 als Audio-Stream verfügbar sein und der Newsletter bietet auch die Songtexte der Lieder zum Nachlesen an. “Humanity and world-unity are the saving message. It is a saving message and true victory to be always on the side of freedom and progress with courage and love. It brings to our world the living celebration of humanity and opens the way to world-unity. DEDICATED TO BARACK OBAMA’S PRESIDENTIAL INAUGURATION ON 20/01/2009 AND THE FIRST 100 DAYS OF HIS PRESIDENCY. !!! Michel Montecrossa’s ‘Courage And Love Climate Change Concert Tour 2009’ Daten!!! 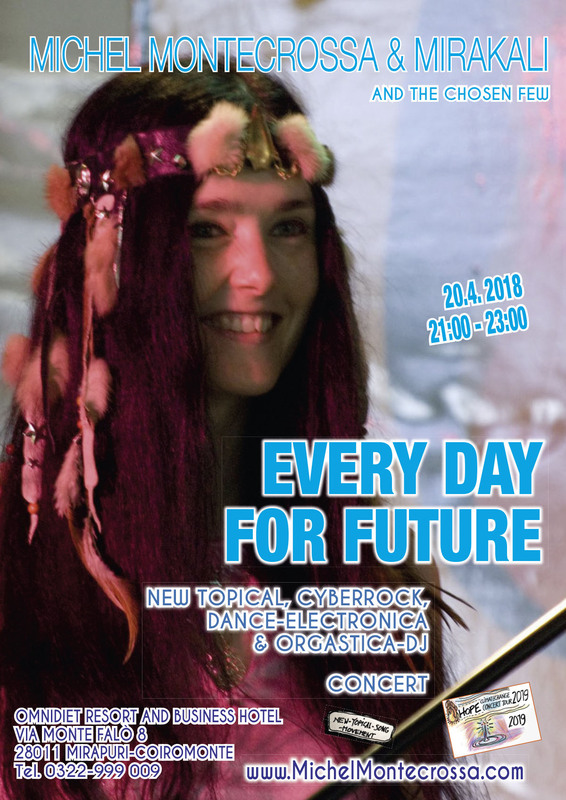 LoveAction’ – Michel Montecrossa’s neue ‘Peace & Climate Change Tour’- CD-Veröffentlichung!! Hier ist sie!! ‘Loveaction’ – die 34. ‘Peace & Climate Change Tour’-CD-Veröffentlichung von Cyberrocker Michel Montecrossa and his band The Chosen Few. Alles weitere im folgenden Pressetext, den ihr auch auf dem Michel Montecrossa Newsletter und den Presseinfos findet. ‘Loveaction’ is Michel Montecrossa’s 34th Peace & Climate Change concert presenting new ways of looking at our world of global changes. Released by Mira Sound Germany as double Audio-CD and double DVD the production presents 29 great Michel Montecrossa songs including the title song ‘Love Action‘, the encouraging ‘Saving Message‘, the swinging ‘Good To Be A Child‘, the forward looking ‘Ecoworld & Cyberworld‘, the thrilling ‘Electrifying Climate Girl‘, the amazing ‘Viking Future‘ and the revealing ‘True Politics‘. Mirakali and Diana Antara contribute message songs like ‘Millions Of Stories‘ and ‘Love Is Our Life‘.